Just 72 short hours to straddle Java and Sumatra to reach Dumai before my Indonesian visa expired. It was to be a test: the bus from Jakarta to Pekanbaru alone would take around 30 hours, barring no breakdowns or choppy seas as the ferry crossed the Sunda Strait. From there, Dumai - the port city where ferries cross to Malaysia - was only a few hours further. So I took the gamble - or at least, I tried. 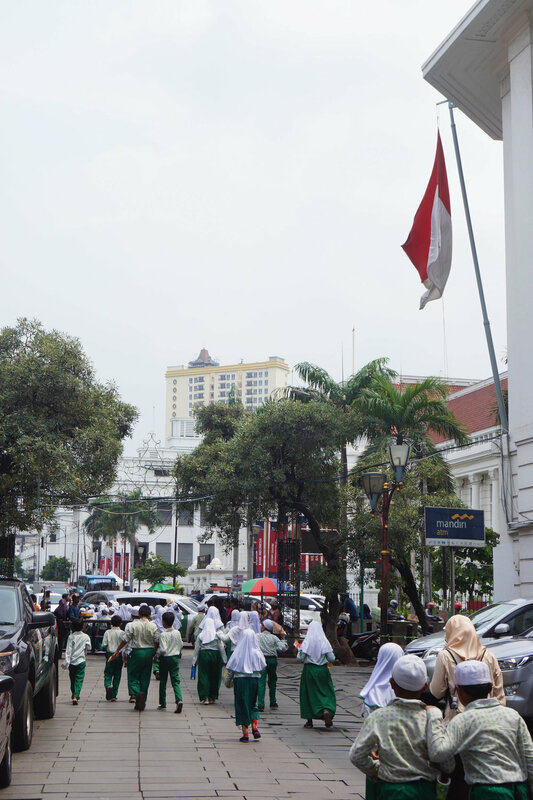 I began what I thought would be my final day in Jakarta early. From my friend’s place in South Jakarta, it was a 16 kilometre ojek ride east to Terminal Pulogebang. As a foreigner in most of Jakarta, you're treated with a refreshing level of indifference that you’d expect in an increasingly global city. This bus terminal, though, was another story. After an hour long ride through diesel-fumed highways, I arrived at Pulogebang to some tumult. At any bus terminal in Indonesia, you’ll get approached by anyone and everyone wanting to sell a ticket. It’s a fun part of traveling across this part of the world - navigating convoluted public transit systems that have been co-opted by entrepreneurial locals. But the sheer scale of this terminal - and the obvious rareness of foreign faces there - made the haranguing all that more jarring, at times discomfiting. 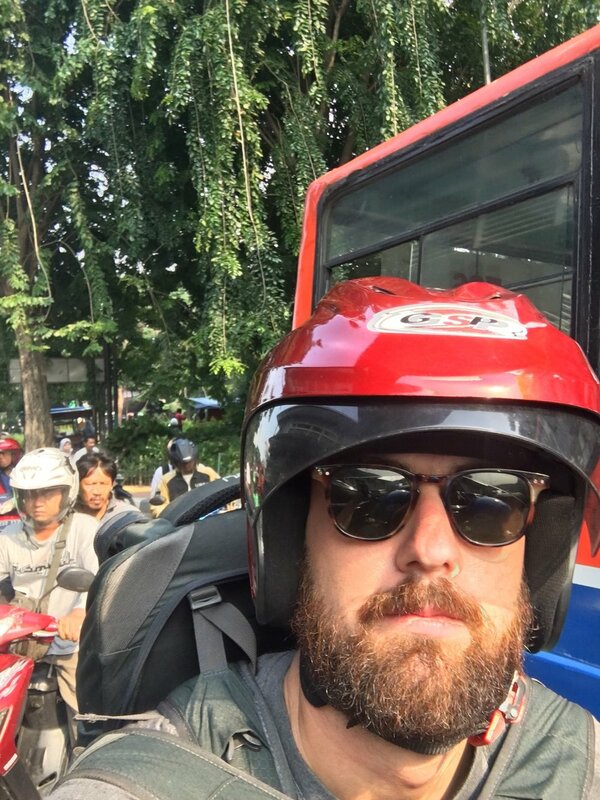 As I dismounted the back of the motorbike on arrival, about a dozen ticket sellers bombarded me, many grabbing at me, tugging my shirt or my pack to drag me away to a ticket booth and usher me into their coaches headed back east to Jogja or Bali. Only intervention from police and local security quieted the crowd, as these authorities ushered me into the terminal. It was an uncomfortable beginning to what would be an even more uncomfortable day. Bus terminals are always strange places. Some of my most uncomfortable moments when traveling have been late-nights at seedy bus terminals in the US and the Balkans. Often on the city-fringe, these stations are usually dank, and seem to always harbour odd-souls. It’s testament to their declining utility: even in a relatively poor nation such as Indonesia, budget airlines dominate - it's often just cheaper to fly than catch the bus. So the terminals simply deteriorate, their physical condition withering along with their customer base. Entering the dark, labyrinthine terminal, I searched for the stall of a company I’d found online. The second story of Pulogebang, where the ticket sellers are, is a bizarre place. Dozens of companies hold offices the size of phone booths, all squished together in a random, nearly incomprehensible assortment. The room is dimly lit, warm and humid, and filthy. It feels like the worst business conference you’ve ever been to - complete with shady businessmen flogging off shoddy products. Finding my stall amongst the chaos, I purchased my Executif Class ticket to Pekanbaru. I was excited: it was to be my last long bus ride in Indonesia, and I thought I’d lash out. The promise of extra leg room and an on-board bathroom for the 30 hour commute was worth the extra few dollars. In the end, this ticket cost me 400,000 IDR (! ), around $40 Australian. It was the most expensive purchase I'd made in Indonesia. My seller was a small, old and grumpy man. He seemed impatient with my incapacity to speak his language (I have enormous sympathy here - I’m constantly ridden with guilt when I can’t even engage in a simple dialogue in the local tongue). But eventually I navigated the language barriers to secure a ticket. I headed upstairs to the lounge and began waiting...and waiting...and waiting. I arrived at around 10 am for a 2pm departure. I spent hours exploring the terminal to ensure I’d get the right bus. I followed instructions: sat where I was told, and kept an eagle eye on the buses coming in and out of the terminal. But it never came. I asked, and I asked again. I showed locals my ticket. Some said the bus had left already. Some said I was to wait til 4, or til 5, or til 6, 7, 10. I frantically raced around to each bus and asked the driver his destination, to no avail. Perhaps it was just sheer incompetence on my part. But it became certain that I’d either missed the bus, or the bus simply didn’t show. I found my original ticket seller amongst the mess downstairs, who berated me in an indecipherable rage - probably rallying against my idiocy for not being able to achieve the modest task of boarding a coach. I tentatively thrusted the Indonesian word for 'refund' into our robust discussion. Needless to say, his irritation grew - my $40 were squandered. In the end, my day was spent roaming the halls like Tom Hanks in The Terminal, and I felt every bit the Hollywood celebrity, spending half my time posing for photos with locals. The police even got in on the act, at one point co-opting me into a group photo with our thumbs up, like Trump and his border guards. I never got the bus. And I sat solemnly in the terminal, feeling the last hours of my Indonesian Visa slipping through my fingers. As time passed by, I had to make a call: risk a visa over-stay and try and take another bus the next morning, fly to Pekanbaru or Dumai to catch the ferry on time, or fly all the way to Singapore - a country I have no interest in and had no intention of passing through this year. In the end, I chose the third option. My rationale was simple: if I had to fly, I might as well do it to ensure I won’t overstay my visa. It was a compromise I was uncomfortable in making. But crossing from Dili to Dumai in 30 days was always going to be an arduous task. In the end, I had to settle with Jakarta being the end of the line in Indonesia, and take comfort in the fact that the entire Eurasian landmass - an unbroken body of land and humanity stretching from Johor to Calais - lay ahead of me. That night, back in Jakarta city, I bought the cheapest flight to Singapore the following day ($50AU, Lion Air), and spent the night drinking craft beers. Sharing my friend’s accommodation that night was an erudite, educated Hazara refugee in limbo in Indonesia. We took him out for dinner at a trendy bar with a distinctly Marrickvillian flavour. Trying to reach Australia, the 18 year old has been told he faces the prospect of 15-35 years (!) before he is resettled in Australia or elsewhere. He was originally told just three years, but recent policy changes in Canberra all but ended his chance of ever contributing to a modern Australia. The rug was pulled out from under his feet, thanks to an ever entrenching Australian political discourse that devalues - even punishes - such aspirants. I felt a semblance of guilt as the night wore on. Here was a young, tri-lingual intellect - who by chance was born into a persecuted minority - constrained to Indonesia for half of his life, chatting with me - an Australian who, via the opportunities of my homeland, was now on a voluntary journey that spans the entire earth. My options were unlimited, my freedom completely unrestrained. The contrast was profound, and sickeningly unjust. The conversation that night was worth my compromise - it was better than sitting on a bus overnight in South Sumatra - even an Executif Class one. Plus, I’d get another stamp in my passport. Country 4, Singapore, awaits.